I had the Raptor version but the sole was coming away and catching. Service was excellent, I returned the boots for inspection and was asked if I wanted a refund or to pay towards another pair. I got the Tundras and they are just as comfortable but the zips are easier to use and they just seem a better boot. I wear a really thick sock and they are still fine. These are a good starter boot, well priced and comfortable, got a size bigger to allow for thick socks and were a perfect fit. Good fit as sometimes wear a 3 but thought thick socks better than a tight 3. Comfortable without the socks and with a good grip. Just hope the price reflects the quality of the boot, too early to tell but pleased so far. Very fast delivery. Fast delivery, arrived the next day. 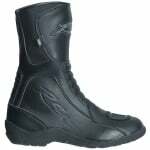 Great quality of boot and can't wait to wear them on bike tour. Arrived super quick, can't go wrong with RST! Boots are great quality, perfect fit and very warm and comfortable. Good value for money. Excellent customer service, they ensured fast delivery so that I got them in time for bike tour!